What should you test drinking water for? What should I test for in my drinking (potable) water? “I want to test my drinking water” is a frequent request. 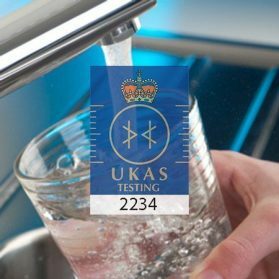 Our first question is ”What do you want testing for?” Unfortunately this is as far as most people have got, so hopefully over the next couple of minutes of reading we can help you make an informed decision on what, if anything, you should test your potable/drinking water for. Are you concerned about bacteria in your drinking water? This is a common concern and is often something people with boreholes, wells or natural springs are wondering, especially if they live near farmland and are concerned about contamination with faecal matter. 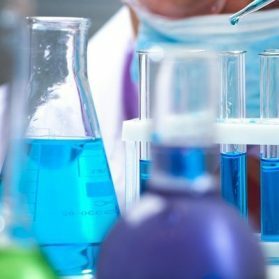 The most effective way to test for this is E. Coli & Coliform water analysis, These bacteria are used as an identifier of when the water may be contaminated by more dangerous organisms like Salmonella. This analysis also includes Aerobic Colony Count also known as TVC (Total Viable Count) which can give an indication of the general quality of the water. Where and when should you test? Please note this analysis needs to arrive at the lab the day after sampling. 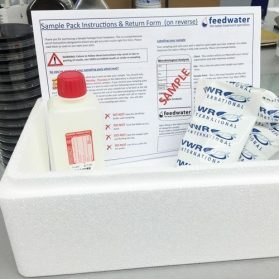 For this reason we include a pre-paid Special Delivery bag for you to return at the Post Office, we also provide an insulated cool box with freezable gel packs to prevent the sample changing in transit. Feedwater can also test for Legionella and Pseudomonas aeruginosa both of which are more associated with colonisation of the property’s plumbing fixtures and fittings. Simply fill the bottle, return and wait for reported results. Insulated Special Delivery Return Packet now included in the price. We require a full 250ml sample to be able to perform this test. Refunds will not be offered where minimum sample requirements are not met. Are you concerned about Metals & Heavy Metals in your drinking water? For some people with private water supplies (not provided by the water utilities) there can be a worry about the metal content of the water. Regulations exist which will tell you which parameters need to be tested for and what constitutes wholesome drinking water. You can find a link to the regulations here: WS Regs 2010. 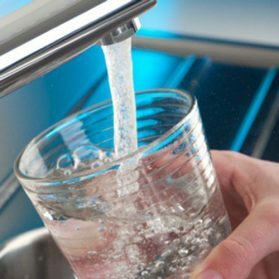 The Drinking Water Inspectorate are the regulator for water quality in England & Wales, their website contains a lot of useful information for people concerned about the quality of their drinking water. We have taken all of the metals specifically mentioned by the list and grouped them together for a drinking water metals analysis package. This makes it simple and cost effective for you to find out the levels contained within your sampled water source. Using this you can check against the limits defined in the link above to determine any potential issues. What chemicals should you test drinking water for? 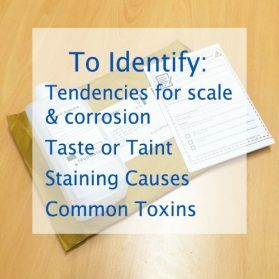 We have a general chemical suite which is designed to determine the scale or corrosion potential of the water as well as assisting in determining potential reasons for strange taste or odour or reason for staining. This includes Nitrates and Sulfates which are of interest to the owners of private water supplies near agriculture, these can be present where there is heavy use of fertilisers and can be a hazard to infants, pregnant or nursing women and the elderly. 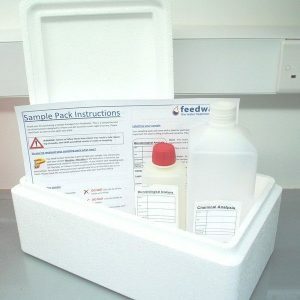 The analysis is time sensitive so we will arrange expedited collection the day you sample. The chemical potability analysis will come with an interpretation of results. Break down of parameters in each analysis in description below. 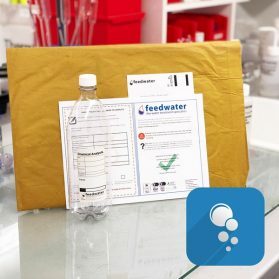 PreviousPrevious post:11 Things you didn’t know about Feedwater – #8NextNext post:When should you test water for Legionella?